When it comes to learning by doing, you'd be hard-pressed to find a challenge more fun than this one. Get the Raspberry Pi 3 Board and Mastery Bundle for $178.99 at Escapist Deals. 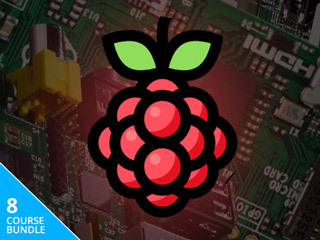 You'll save 80% on a Raspberry Pi 3 board and seven awesome courses. You don't need any experience to get started - all of the projects are easy enough for beginners. Learn the skills and tools you need to build a robot arm you can control wirelessly, make home automation solutions to turn devices on and off from your smartphone, learn how to build and control a robot, start bitcoin mining with Linux commands, build a walkie-talkie, and more. All throughout, you'll learn essential skills so you can start dreaming up and creating your own projects when you're done with the courses. Get the Raspberry Pi 3 Board and Mastery Bundle for $178.99 at Escapist Deals. Very tempting for those that want to learning experience this can bring. Think about it: how many hands on programs are out there with kind of chest of stuff cost under $200. Only thing that makes it a tough sell: buying things at your own pace and learning from online materials will cost a ton less, at least at first. If you like what you're doing, you can always buy more.